No matter what your cash flow concerns, you have the power to conquer them. Money woes keeping you up at night? No matter how much you earn, you’re not alone, says Brad Klontz, PsyD, a certified financial planner in Lihue, HI. Trouble is, none of us can afford to be members of such a stressful club. Constant anxiety over late fees or the next car payment can trigger health concerns like depression—not to mention turn us into the workaholics or penny pinchers we swore we’d never become. The good news: These super-easy tips ease the strain while helping you get your finances in shape. 1. Pick one financial goal. When people are feeling stressed about money, part of the problem is they want to pay off their credit card bill, renovate their bathroom and fund their kid’s college education all at once. That’s unrealistic, says financial behaviorist Jacquette M. Timmons, president and CEO of Sterling Investment Management. “Instead, set a timer for 5 minutes and write down all your money goals,” she says. “Then choose one thing to focus on, like saving an extra $500 over the next 90 days. It will lessen your anxiety and keep you motivated.” Once you get cracking, post your progress using #90daygoals. 2. Create a family balance sheet. Cross fear of the unknown off your list by tallying up what you own and what you owe. 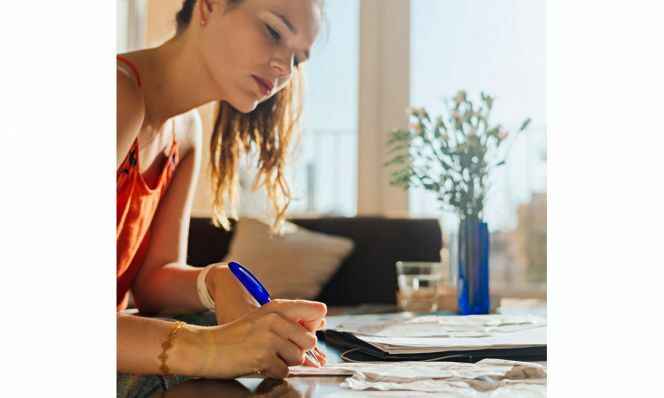 “List assets, including cash, retirement accounts and your home,” says Alexandra Taussig, SVP, Women and Investing at Fidelity Investments. “Then list liabilities such as loans and credit cards.” The difference between the two is your net worth. In the red? See tip #1. 3. Review last month’s expenses. to make adjustments,” says Timmons. Free or low-cost apps like Digit, Mint and Acorns make it simple to put money aside automatically. Set a goal, like dumping $3,000 in debt over the next 12 months. The app details how much you need to save daily to reach the goal. “Once you take that first step, it alleviates tension because now you’re progressing toward your goals,” says Klontz. 5. Open a college fund. Seriously, you can do it in less than 20 minutes. And if you have kids who may attend college, it’s worth every second to start a 529 plan now. Let’s face it, college costs are astronomical. The average tab for tuition and fees for the 2017–2018 school year was $34,740 at private colleges, reports The College Board. If you start today, you can begin to lessen your burden tomorrow. 6. Bump up your 401(k) contributions. A lot of the individual wealth in the U.S. is created through investing in a 401(k). One easy way to increase your contributions is to direct a portion of any annual raise or bonus toward your 401(k). “Even small retirement investments can grow to large amounts over time thanks to the power of compounding interest,” explains Taussig. → The median retirement account for all working-age families in the U.S. is worth just $5,000. “Save at least $2.74 a day,” says Timmons. “If you divide $1,000 by 365 days, that’s the daily amount.” Over 10 years that’s $10,000—twice the median. → The average U.S. household with credit card debt has a $15,983 balance. “If that’s you, find out the interest rate on your card and switch to one with a lower rate or zero interest,” says Klontz. Check if there are fees for the transfer and see what the rate may go up to later. You can compare low-rate cards at bankrate.com and nerdwallet.com. → The average 2017 college graduate has an estimated $39,400 in student loan debt. Don’t wait to start saving for your kid’s tuition,” advises Taussig. “You can make automatic 529 contributions directly from your paycheck. It’s fast and easy to set up.” Go to savingforcollege.com for details.